Selenium is a mineral essential for forming antioxidant enzymes. And, as we all know, antioxidants help to get rid of free radicals and avoid damage caused to the body cells. This, in turn, prevents many diseases and delays ageing. Selenium is also linked to a healthy immune system. For all these reasons and many more, it is important for you to know which foods you should eat in order to meet your daily recommended dose of selenium. Here is a list of foods that contain moderate to high levels of selenium. This will definitely help you meet your daily quota of selenium. 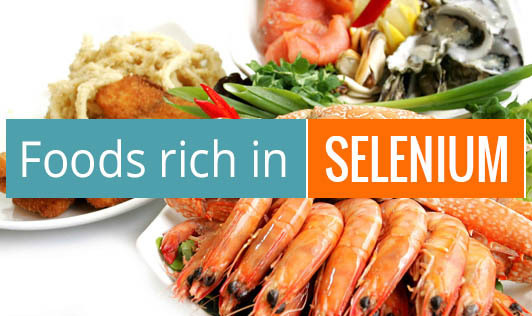 Seafood: Seafood, especially foods like tuna, cod, and shellfish are rich sources of selenium. Meat: Chicken, beef, and turkey in particular contain high levels of the mineral. Nuts: Nuts are rich sources of the mineral selenium. Among the selenium-rich nuts walnuts and Brazil nuts in particular contain the highest amount of selenium. Cheese: There are many types of cheese that have high amounts of selenium. Cheddar and cottage cheese are good sources. Rice: Both white and brown rice contain sufficient amounts of selenium. Eggs: Eggs are a healthy way of meeting your daily recommended allowance of selenium. Oats: Oats is another food that is a good source of selenium and can increase your daily intake of selenium. Oats is also known to decrease cholesterol levels and improve heart health when taken regularly. The daily recommended dose of selenium for a healthy adult is 55 µg/day. The daily recommended dose of selenium for women during pregnancy and lactation is 60 and 70 µg/day, whereas children require much lower dosages of selenium per day. A 1 to 3 year old requires 20 µg/day, a 4 to 5 year old requires 30 µg/day, and a 9 to 13 year old requires 40 µg/day.